1. Frankincense Hydrating Facial Mist - One of my handbag essentials that can be used as a hydrating toner or simply as a refresher during the day over make up! Unlike most facial mists out there, this doesn't just smell scrumptious, it actually hydrates your skin since it contains hyaluronic acid. 2. Rose & Mallow Moisturiser - This has been my daily moisturiser for years as it's soothing, refreshing, hydrating and very gentle. I apply a thin layer over my serum. 3. Wild Rose Beauty Elixir - I've been using this serum for the last 2 years, and it feels ultra luxurious on the skin. It contains hyaluronic acid for moisture, brightening turmeric, anti-aging peptides, and wild rosehip oil that contains anti-oxidant vitamin C. For the last month I've been trying out Hydraluron (full rave here), which I also do love as it contains a much higher percentage of hyaluronic acid, but I've gone back to using this NYR serum during the day and the Hydraluron during the night. 4. Rehydrating Rose Facial Polish - This really helps to brighten and leave my skin smooth. I use this once a week as an exfoliating treatment, and I find it to be very effective even though it feels so gentle on the skin. 5. White Tea Enriching Facial Mask - This is my favourite face mask EVER! I apply this once a week to give my skin a boost in hydration and antioxidants. Containing hyaluronic acid, anti-aging and anti-oxidant rich white tea and purifying kaolin, if you have dry or sensitive skin this one really is for you! 6. 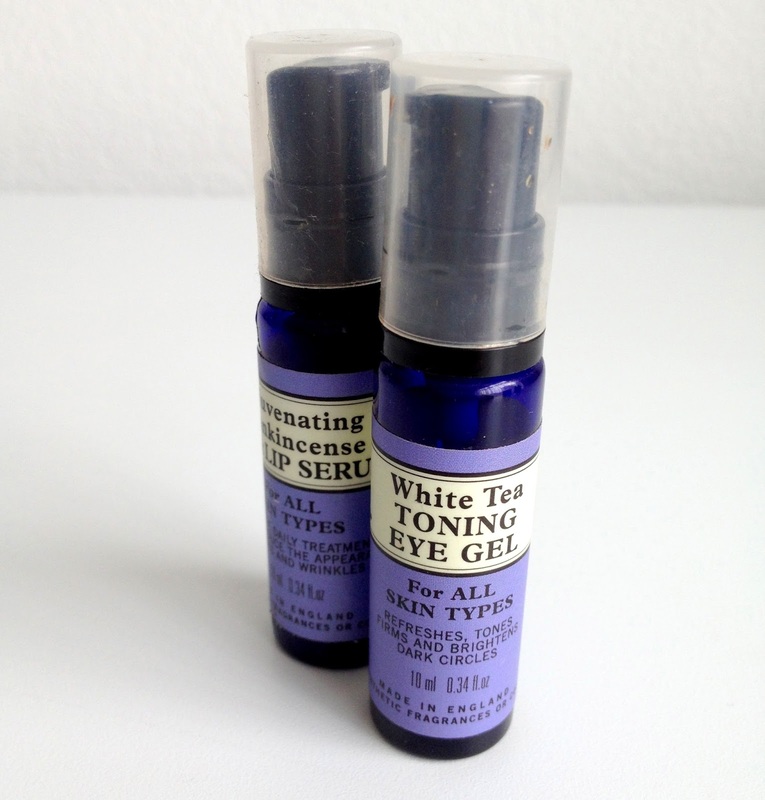 White Tea Toning Eye Gel - This is one of the eye creams from NYR that I adore. On application it instantly feels cooling, reduces puffiness and minimizes the appearance of dark circles. This is a great daytime eye cream, and you only need to apply very little due to its gel texture. 7. Rejuvenating Frankincense Eye & Lip Serum - This is my top eye cream of all time. As I've mentioned in my previous post, the eye is the only area of the skin that doesn't have oil glands, and therefore eye creams need to be very hydrating. This one contains my favourite thing in the world - hyaluronic acid (obviously!) - as well anti-oxidants and collagen-stimulating tripeptides. As suggested by the name, you can also use this on your lips! 8. Soothing Bath Oil - I like to apply the same principles as my facial skincare to my overall body skincare, i.e. I avoid using body and bath products with parabens and other nasties, and this is why I turn to NYR for my bath products too. This aromatherapeutic blend of lavender, geranium, cypress and bergamot smell gorgeous in the bath, and leave the skin incredibly soft. 9. Aromatic Foaming Bath - This one is a blend of lavender, spanish marjoram and geranium. I like to add this to my bath when I'm in the mood for bubbles, and unlike other foaming bath products it doesn't dry out my skin. 10. Calming Aromatherapy Candle - Now as much as I love my Diptyque and my Jo Malone, what I like about the NYR candles is that their wax is a 100% organic blend of beeswax and botanical wax, meaning there's no petroleum-based paraffin wax and no harmful toxins or sooty smoke. This particular candle has a blend of rose, patchouli and geranium oil that smell lovely and really helps me to wind down before bed. Organic Eye Make Up Remover - If you're looking for a make-up remover that is completely natural, oil-free and also does the job, then this is the one for you. Rose Formula Anti-Oxidant Facial Mask - This is a great mask if you have normal skin. It is very brightening and leaves the skin soft and revitalized. Frankincense & Mandarin Body Lotion - What I like about this particular lotion is how rapidly it absorbs into the skin but still leaves my skin feeling very hydrated. The frankincense also has a toning effect so it really leaves your skin looking slightly tightened and smooth. Power Berry Daily Moisture - This is great for keeping young skin hydrated and radiant. It's very lightweight and easily absorbed making it an excellent day moisturiser. Have you tried anything from NYR? PS - A fun fact about the carbon-neutral NYR is that their bottles are blue to ensure the products last as long as possible, and they are of course 100% recyclable. In fact if you recycle them in store, you will get 10 pence off per bottle on your next purchase!